Mr Bean: The Animated Series is a 2002 animated television series based on the 1990 British TV series Mr. Bean. Characters from the original live action series included Mr. Bean, Irma Gobb, Teddy and the mysterious driver of the Reliant Supervan, with the addition of Mrs. Wicket, Bean's landlady, and her evil cat Scrapper. The series again featured little actual dialogue, with most being either little soundbites or mumbling. Rowan Atkinson provided the voice for Bean, and all of the animated Bean actions are taken from Atkinson himself. Other characters' voices are provided by Jon Glover, Rupert Degas, Gary Martin, Thea White and Lorelei King. Despite the series' actual title being simply Mr. Bean, some broadcasters referred to this series as Mr. Bean: plus a subtitle for disambiguating with the original live-action series. Disney Channel in Southeast Asia refers this series as "Mr. Bean - The Animated Series" and the original live-action series as "Mr. Bean - Live Action Series" in their schedule. 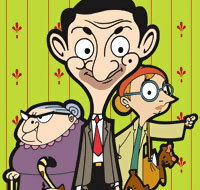 The German version, aired on Super RTL, is titled "Mr. Bean - Die Cartoon-Serie". Super RTL is a Cologne-based German television network operated by RTL Disney Fernsehen GmbH & Co. KG. It was the second German television channel aimed mostly at children (the first was Nickelodeon and Cartoon Network). It was launched in 1995 as a joint venture between RTL Group predecessor company CLT-UFA and Disney. During the daytime and early evening until 8:15 pm, there are only shows for children on Super RTL, including many American and particularly Disney series. Super RTL used to air a large number of Nickelodeon shows as well during the time that rights owner Viacom didn't operate their own children's channel in Germany (1998–2005), but this supply has dried up with the re-introduction of Nickelodeon to Germany in 2005. In prime time, Super RTL mostly repurposes older RTL Television series or airs family-branded, inexpensive entertainment shows.